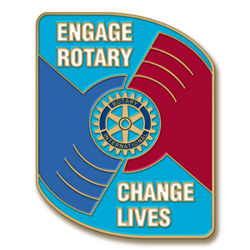 2013-14 Theme Lapel Pins - "Engage Rotary, Change Lives" - 1" gold plate. This laptop bag is made of 600D polyester and sized to fit most 17" laptops. These "eco-friendly" bamboo coaster sets are perfect for any occasion!